Partly cloudy. High 68F. Winds NE at 5 to 10 mph..
Nebraska recruit Turner Corcoran (middle) watches warmups before the Red-White Spring Game on Saturday at Memorial Stadium. This whole thing would have been easier for Turner Corcoran if the tables at the Watering Hole weren’t so dang close together. 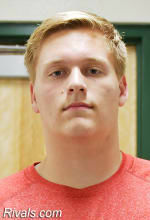 The prized offensive tackle prospect from Lawrence, Kansas, had just arrived on Friday evening and was getting dinner at the local joint with Nebraska offensive line coach Greg Austin and some staffers and knew that: 1) Scott Frost was going to drop by and say hello while they were there and 2) he was going to give his verbal commitment to the Huskers after a long recruitment when the head coach arrived. So the moment came and Corcoran, all 6-foot-6 and 280 pounds of him, had a little trouble getting out of his seat and to the head coach. “I was like ‘Oh, my god,’ it was embarrassing,” Corcoran recalled on Sunday morning with a laugh. “I said 'Alright, I’m committed. I’m a Husker,' and the whole room exploded,” Corcoran said. And with that, one of the most important recruits for Nebraska’s 2020 class was officially on board. The only problem? There was no way he’d be able to keep it quiet for long, considering the restaurant broke out in applause and they played the fight song on the stereo system for the whole place to hear. So the tackle, ranked the No. 32 overall prospect in the country by 247Sports and the No. 50 player by Rivals, tweeted out the news right when Saturday’s Red-White Spring Game ended. “It felt good, finally being able to say I’m committed to a school that I love and that I’m to die for,” Corcoran said. Now, NU has a class bedrock to build from, namely in Corcoran and quarterback Logan Smothers (Muscle Shoals, Alabama), who was also on hand Saturday. Corcoran, in particular, has taken to peer recruiting standout in-state receiver Xavier Watts (Omaha Burke), outside linebacker Blaise Gunnerson (Carroll, Iowa) and fellow offensive lineman Alex Conn (Derby, Kansas). “They’re really close with me especially after yesterday and getting to just be able to sit with those guys, it’s really cool,” Corcoran said. Last month, Corcoran was on campus for an unofficial visit with Watts and Gunnerson and the trio has formed a tight bond. “Those are two really important guys headed into the future of the Huskers that we feel like we can get, obviously, and that are going to be program-changers right way," Corcoran said. "This isn’t recruiting talk. These guys can straight-up play. It’s an exciting time for them and an exciting time for myself, too. “I told them, go with that gut feeling. If at the end of the day it’s not Nebraska, I’m still going to be happy for you no matter what. Obviously we want you here and I want you here at Nebraska." Gunnerson and Corcoran actually first met last fall at NU’s home game against Minnesota, making this weekend the third time they’ve been on campus together. “We’ve had this joke running for a few months now saying how we’re going to be doing one-on-ones soon, playing at Nebraska and going against each other in one-on-ones." Suffice it to say, Corcoran and the Huskers would be thrilled if that joke turned into reality. For now, though, Corcoran is a critical recruiting win for the program in his own right. He said he’s willing to make the three-hour drive back to campus whenever the coaching staff wants him around to help recruit and he’ll come on his own, too. On days like NU’s national Adidas lineman camp or a Friday Night Lights camp in June, that kind of presence can only help the Huskers.